Before coming to Japan three days ago, I spent my last days in Portugal with Maria. 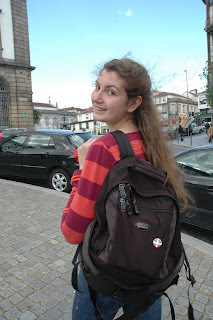 In the previous post I talked about our trip to Coimbra. 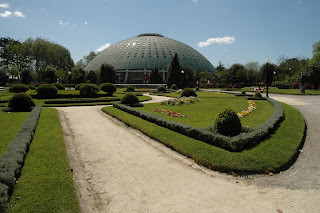 Here I will put some pictures from our time in Vila Real and Porto which was also great. 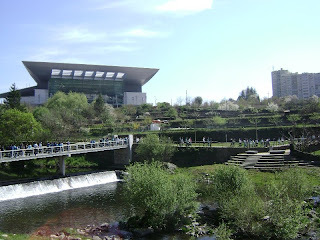 We enjoyed a very nice weather in Vila Real so we walked to our favourite places near the commercial centre Dolce Vita (the big building in the picture), where there is a nice park with a river and some cliffs. In Dolce Vita we went to watch the movie "Slumdog Millionaire" and we both loved it, definitely a must see. 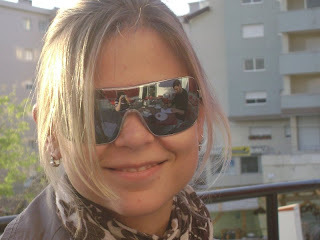 Life in Vila Real is very calm and relaxing. There are very nice coffee shops everywhere where you can have a coffee and some pastry for very reasonable prices. 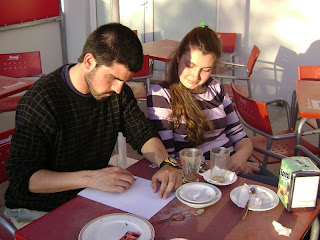 In one of them, I made a drawing for Maria's flatmate Iva and her boyfriend. 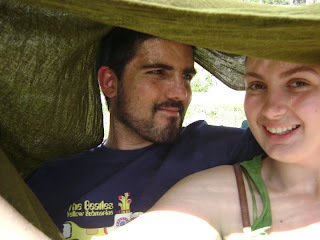 They are both from Czech republic (Brno). Iva had lost her Dolce Gabanna fashionable glasses but she was lucky enough to get them back. 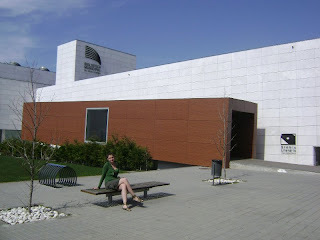 Vila Real's library had very modern installations and an interesting architecture. Inside the library, they even had sofas and equipment to watch DVDs. 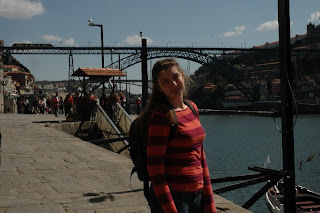 Although we only stayed in Porto for one morning we had time to see quite a lot. At the old town, probably the most beautiful part of Porto, there were some swedish football fans because that day there was a match against Portugal. 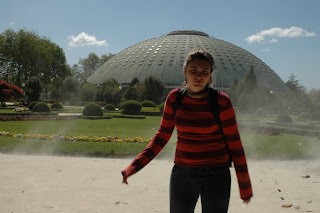 After walking sometime we reached the Crystal Palace where I took this cool pictures with Maria's camera. Inside the building there were University students showing what kind of things they do at their faculties. I found it very useful for future students that are still choosing what degree they want to study. Maria also took me to a very cool and hidden tea place nearby. She asked for some "magic" green tea and I asked for one that was a bit more expensive because I was expecting to get something cool, but in the end it wasn't that cool. 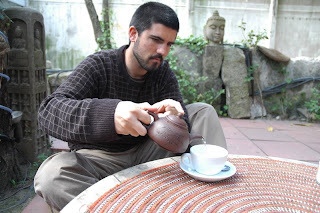 They had tea from virtually every famous tea country in the world, especially from China. 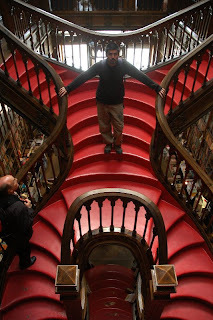 After the tea, I gave a pin with the Basche country flag to Maria and we entered a very old bookshop that had very interesting books and a nice internal architecture. Dani, are you already in Japan? Yesterday we had a meeting with some Artbox people in Bilbao(we were more than 15 people...), and some of them asked for you. Empieza a contarnos cómo ha sido la llegada!! I just put the post about the arrival but i have a lot of things to tell.. im still a bit busy but during the week i hope ill find more time! !